The American statesman Thomas Hart Benton was born at Hillsborough, Orange county, North Carolina, on the 14th of March 1782. His father, an Englishman of refinement and scholarship, died in 1790, leaving the boy under the influence of a very superior mother, from whom he received lessons in book learning, piety and temperance quite unusual in the frontier country. His home studies, facilitated by his father's fine library, were supplemented by a brief stay at the University of North Carolina (Chapel Hill) in 1799. The family removed, probably in this year, to a large tract of land which had been acquired by the father on the outskirts of the Indian country (at Benton Town, now Leipers Fork) near Franklin, Tennessee. The following years, during which Benton was at various times school teacher, farmer, lawyer and politician, were the distinctively formative period of his life. His intense democracy and many features of his boldly cast personality were perfectly representative of the border people among whom he lived; although his education, social standing and force of character placed him above his fellows. In 1809 he served a term as state senator. Between 1815 and 1817 he transferred his interests to St. Louis, Missouri, and in 1820 was elected United States Senator from the new state. His senatorial career of thirty years (1821-1851) was one of extreme prominence. 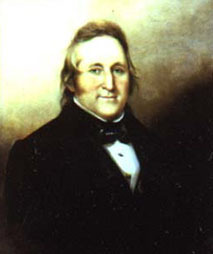 A friendship early formed in Tennessee for Andrew Jackson was broken in 1813 by an armed fracas between the principals and their friends, but after the presidential election of 1824 Benton became a Jacksonian Democrat and Jackson's close friend, and as such was long the Democratic leader in the Senate, his power being greatest during Jackson's second term. He continued to be the administration's right-hand man under Martin Van Buren, but gradually lost influence under James Knox Polk, with whom he finally broke both personally and politically. The events of Benton's political life are associated primarily with three things: the second United States Bank, westward expansion and slavery. In the long struggles over the bank, the deposits and the "expunging resolution" (i.e.. the resolution to expunge from the records of the Senate the vote of censure of President Jackson for his removal of the government deposits from the bank), Benton led the Jackson Democrats. His opposition to a national bank and insistence on the peculiar virtues of "hard money", whence his sobriquet of "Old Bullion", went back to his Tennessee days. In all that concerned the expansion of the country and the fortunes of the West no public man was more consistent or more influential than Benton, and none so clear of vision. Reared on the border, and representing a state long the farthermost outpost across the Mississippi in the Indian country, he held the ultra-American views of his section as regarded foreign relations generally, and the "manifest destiny" of expansion westward especially. It was quite natural that he should advocate the removal westward of the Indian tribes, should urge the encouragement of trade with Sante Fe (New Mexico), and should oppose the abandonment in the Spanish treaty of 1819 of American claims to Texas. He once thought the Rocky Mountains the proper western limit of the United States (1824), but this view he soon outgrew. He was the originator of the policy of homestead laws by which the public lands were used to promote the settlement of the west by homeseekers. No other man was so early and so long active for transcontinental railways. But Benton was not a land-grabber, whether in the interest of slavery or of mere jingoism. In the case of Oregon, for instance, he was firmly against joint occupation with Great Britain, but he was always for the boundary of 49 degrees and never joined in the campaign-jingo cry of "Fifty-four Forty or Fight." It was he who chiefly aided Polk in withdrawing from that untenable position. He despised pretexts and intrigues. Both in the case of Oregon and in that of Texas, though one of the earliest and most insistent of those who favored their acquisition, yet in the face of southern and western sentiment he denounced the sordid and devious intrigues and politics connected with their acquisition, and kept clear of these. For the same reason he opposed the Mexican War, though not its prosecution once begun. In the Texas question slavery was prominent. Toward slavery Benton held a peculiarly creditable attitude. A southerner, he was a slaveholder; but he seems to have gradually learned that slavery was a curse to the South, for in 1844 he declared that he would not introduce it into Texas lands "where it was never known", and in 1849 proclaimed that his personal sentiments were "against the institution of slavery." In the long struggle over slavery in the territories, following 1845, he was for the extreme demands of neither section; not because he was timorous or a compromiser, -- no man was less of either, -- but because he stood unwaveringly for justice to both sections, never adopting exaggerated views that must or even could be compromised. The truth is that he was always a westerner before he was a southerner and a union man before all things else; he was no whit less national than Daniel Webster. Hence his distrust and finally hatred of John C. Calhoun, dating from the nullification episode of 1832-1833. As the South under Calhoun's lead became increasingly sectional and aggressive, Benton increasingly lost sympathy with her. Though he despised political inaction Abolitionists, and hated their propaganda as inimical to the Union, he would not therefore close the national mails to Abolition literature, nor abridge the right of petition. No statesman was more prescient of the disunion tendencies of Calhoun's policies, and as early as 1844 he prophetically denounced the treason to the Union toward which the South was drifting. He would not drift with her for the sake of slavery, and this was his political undoing. In 1851 Missouri rejected him in his sixth candidacy for the Senate, after he had been an autocrat in her politics for thirty years. In 1852 he was elected to the House of Representatives, but his opposition to the repeal of the Missouri Compromise caused his defeat in 1854. An unsuccessful campaign for the governorship of Missouri in 1856 ended his political career. He died at Washington on the 10th of April 1858. Benton's entire career was eminently creditable, and he is, besides, one of the most picturesque figures in American political history. His political principles -- whether as regarded lobbying, congressional jobbing, civil service or great issues of legislation and foreign affairs -- were of the highest. He was so independent that he had great dislike for caucuses, and despised party platforms -- although he never voted any but the Democratic ticket, even when his son-in-law, John C. Fremont, was the Republican presidential candidate in 1856; nor would he accept instructions from the Missouri legislature. His career shows no truckling to self-interest, and on large issues he outgrew partisanship. Although palpably inferior to each of his great senatorial colleagues, Webster, Henry Clay and Calhoun, in some gifts, yet if character, qualities and career be taken in the whole his were possibly the most creditable of all. Benton was austere, aggressive and vain; besides, he had a fatal deficiency of humor. Nevertheless he had great influence, which was a deserved tribute to his ability and high character. An indefatigable student, he treated all subjects capably, and especially in questions of his country's history and the exploration of the West had few equals -- in the latter none. He acted always with uncalculating boldness, and defended his acts with extraordinary courage and persistence. Benton wrote a Thirty Years View... of the American Government (2 vols., 1854-1856), characteristic of the author's personality; it is of great value for the history of his time. He also compiled an Abridgment of the Debates of Congress, 1789-1850 (16 vols., 1857-1861), likewise of great usefulness; and published a bitter review of the Dred Scott decision full of extremely valuable historical details -- Historical and Legal Examination of... the Dred Scott Case (1857). All were written in the last eight years of his life and mostly in the last three.